At Gold Arrow Camp, we strive to not only provide our campers with memorable, happy, and life-changing camp experiences during the summer, but also to provide resources to our camp families that enhance our campers’ lives year-round. 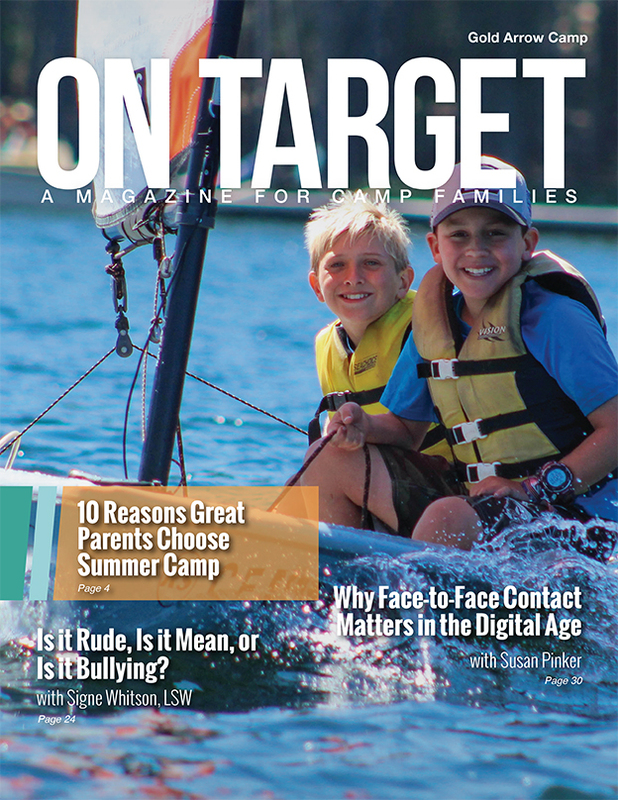 On Target, our magazine for camp families, is an annual resource we provide for that purpose. In each edition, we feature articles from parenting experts, best-selling authors passionate about positive youth development, and long-time staff members. Our current On Target features articles and excerpts on several topics that directly impact our children’s (and our own) happiness. Camp Director and parenting blogger Audrey “Sunshine” Monke shares the ten reasons great parents choose summer camp and what the best age for camp is. We also have an interview between Sunshine and best-selling author Tina Payne Bryson about her book, The Yes Brain. Happiness expert Christine Carter, author of Raising Happiness and The Sweet Spot writes about how camp fosters year-round happiness. We also have an article on how campers get to experience the awe of nature from Meredith Monke. Signe Whitson shares her important insights on the differences between behaviors that are rude, mean, or bullying and we feature an excerpt of Susan Pinker’s article for The Guardian about the importance of why face-to-face contact matters so much in a digital age. To receive the latest edition of On Target magazine, please complete the information requested below. Check out previous issues of On Target! Click the center of the magazine for fullscreen desktop viewing.